20. 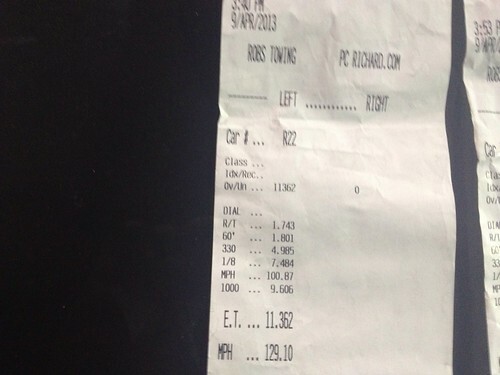 10.788 @ 142.52 SlowPoke SlowPoke tuned, ETS 6766, E85, radial. 1. 9.433 @ 154.44 STY? Fastest 1/4 Trap:125.65 mph Kozmic Sty? Fastest 1/8 Trap: 101.42 mph Kozmic Sty? Last edited by Darksun280; Jan 19, 2018 at 02:10 PM. You can only have your car on the same list once. if you run a 10.0 and a 10.1 you don't get spots 1&2. fastest time goes up for that category once. You got to post a slip. 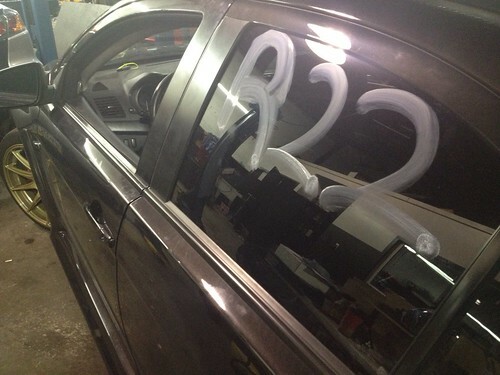 also a pic or vid with the car and its track number on it. Shouldn't be hard to do we all got camera phones. Main list will be top 20 Gsr mixed with Mr every man for himself. I will also make a separate GSR and MR list. For these sections it doesn't have to be on your best pass you just need a slip and pic of your track tat from any run. Comment with any suggestions you may think of and it will be taken into consideration. Last edited by Darksun280; Jun 5, 2013 at 12:54 PM. I'm rooting for ya. Beat my 11.2 so then we can get this 10 second warfare popping. The few who are capable need to start taking out Gumps 10.5 time. That 1/4 mile list needs to get shaken up. I will attempt my man, no promises as no idea how my 6 puck will hold up to the new found power. I just want the 11's for now, then I will try 10's lol. I'm sure you'll find you way into multiple categories on the up coming lists. ET won't be everything going forward. If you got any ideas let me know. If anyone catches any mistakes please let me know. I'm also trying a green blue color scheme to help your eyes not strain when looking through the list. let me know if you like it or not. Ok so heres the deal. There Are some times on the original list that I can't find a slip or anything of so going forward times from the original list I left but if you weren't on the original list and you posted about running a time but never showed a slip or vid or anything I didn't put your name down. Come up with a slip or vid that shows the time clearly. Anything from this year forward you need a slip and a pic of your car with the Car number from the slip. It May seem like a bit much at first but it's pretty normal. We all have camera phones or know some one with a camera phone at this point. Last edited by Darksun280; Jun 4, 2013 at 03:55 PM. Good job on the update, looks nice and much easier to read. Errors: copy-paste error on #9 of GSR stock turbo list. Inconsistent listing of time/trap vs username (I like the time/trap first, easier to read through the relative times). Cool. I put it together while i was at work. Im fixing some of the things you mentioned from my phone right now. Is the fastest MR not on the main list? Wow good catch murlo. Damn that 1/4 mile list has a whole new feel to it now. Also your findings just pushed Mr Buschur off the list. 2013 list is up so Far I'll keep looking but thats what I can find so far. Now I'm going to start adding links to the posts where the info was sourced from. so if you look at the number one spot on the list at the end I put a link to where the proof of the pass is located. most I will re upload them into this thread to keep them in one spot. Last edited by Darksun280; Jun 4, 2013 at 11:18 PM. Last edited by Darksun280; Jun 4, 2013 at 11:25 PM.